No one likes waiting around for their laundry to dry. So take a load off your mind the next time you tackle a heap of clothes with a few tips to dry your clothes faster. Not all that long ago, clotheslines were the household norm. Today, however, while plenty of people like to air their ‘dirty laundry,’ only 21 percent of the population still hangs their clothes out to dry. In this fast-paced world, speed is everything. So what if we told you that your hard-working clothes dryer could work even harder? It’s so simple, it can take as little as a minute. Try any of the following tips to increase your appliance’s efficiency and shrink the time it takes to dry the load—not your clothes. 1. Clean the dryer vent and exhaust duct. Periodic cleaning prevents lint buildup, which would otherwise impede the airflow and increase dry time. Perhaps most importantly, though, regular maintenance prevents an appliance fire. You should clean your dryer hose with a brush once a year, and inspect the vent for any blockages at least every 6 months. 2. Shorten the dryer hose. When you disconnect your dryer’s vent hose (that metallic, accordion-like tube) for cleaning, consider truncating it at the same time. The hose only needs to be long enough to reach your dryer, situated just a few feet away from the wall. A shorter hose requires less energy to pump moisture-laden air out of the machine than a full-length one, so your dryer can do its job up to 20 percent faster. 3. Remove lint from the filter screen. Emptying the lint screen after each load is another task that’s absolutely necessary because of lint’s flammability. 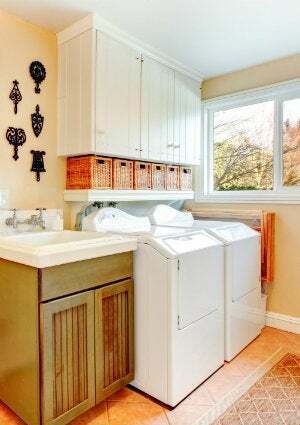 If the screen gets too clogged, the dryer may overheat and automatically shut off as a safety precaution. In some cases, the tumbler still rotates and blows, so you won’t realize the heating elements are off until you open the door to find a pile of wet clothes. Forgo a fire and any wasted time by keeping it clean. 4. Shake water from your wardrobe. Immediately after the laundry comes out of the washer, wring and shake out each item over the sink to remove excess water. If some pieces are overly wet, place them back in the washer and run only the “spin” cycle to pull out some of the moisture. This may take an extra 15 minutes, but the extra cycle in the washer will save you later in overall dry time. 5. Don’t overload the dryer. It’s a mistake to think stuffing the dryer will save you time—it actually has the opposite effect. Clothes need room to tumble so heated air can pass over and through each item, so keep your load to a minimum for maximum effectiveness. 6. Resist opening the door. Whenever you open the dryer door mid-cycle, warm air escapes, and a little more time is needed to completely dry the load. Plus, if you’re adding a forgotten item, the single sopping wet piece in a partially dry load throws off your clothes dryer’s moisture detector. That means some clothes might be over-dried and others still damp. To avoid this, resolve to sticking stragglers on a drying rack, instead. 7. Throw in the towel—literally. If you have a few items you need to dry fast, toss them into the dryer with a large, dry towel to absorb some of the moisture. 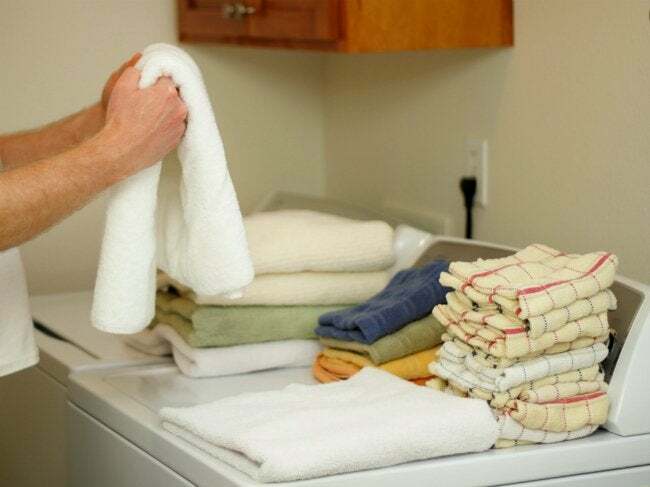 After 15 minutes, remove the towel and hang it up to dry; otherwise it will continue to contribute to the moisture level in the dryer and extend the drying time, thus defeating the purpose. Then, when you check on the rest of the items in another five to 10 minutes, you should find the load ready to go.